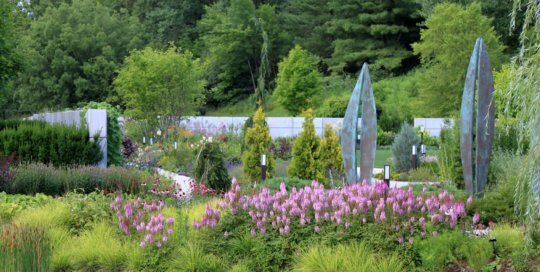 Art and sculpture add to the visual experience of any garden, serving as focal points that anchor plantings or interacting with the landscape to direct the viewer’s attention or movement. Sculpture is inanimate yet its appearance changes constantly according to time of day, weather conditions and seasons of the year. 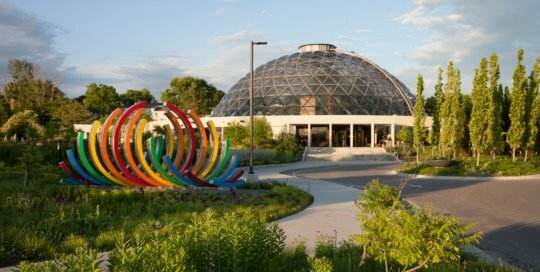 The Botanical Garden is fortunate to own three pieces of sculpture that honor the talents of Midwestern artists. The iconic rainbow sculpture at the head of Robert D. Ray Drive is entitled Spectral Liberation and was created by internationally recognized artist Christiane T. Martens. It was installed at the front entry of the former Botanical Center in 1984, donated by the family of Connie Belin, a local civic leader. The restoration of Spectral Liberation was made possible by a generous gift from the Belin family. 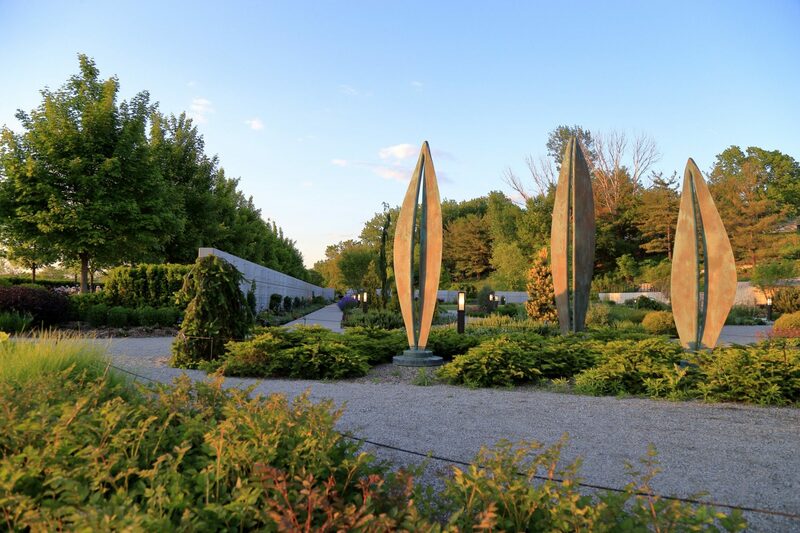 The sculpture entitled “Persona I, II, III,” by Des Moines native Mark LaMair, was donated by the Des Moines Herb Study Group and installed in 2008. 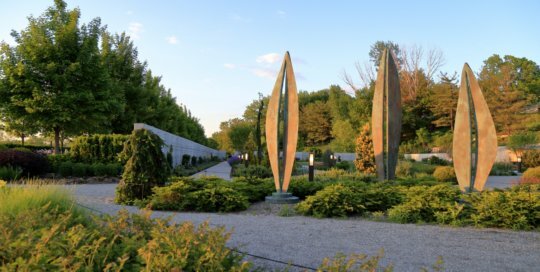 The three leaf-like pieces, each of a different size, dance at the edge of the Rutledge Conifer Garden, reinstalled in August 2014 by the artist during the Botanical Garden expansion. The former courtyard sculpture by Des Moines artist Peter Marasco was a gift of Robert Sterling and family. The free form resembles a budding flower, ready to bloom. The sculpture previously operated as a fountain in the former Botanical Center courtyard. It is currently off display. Spectral Liberation, June 2015. Photo by Scott Shigley. Persona I, II, III by Mark Lamair in the Rutledge Conifer Garden. Photo by Kelly Norris. Looking northeast towards Persona I, II and III and the Koehn Garden in the background, July 7. Photo by Kelly Norris.